Oh, no! You don't know how distressed I am to read this! Immediate reflexes: must try. . .must buy. . . !! And I was trying to stop buying for a little while. Oh, well, right now it seems too much and too far away for me to get unsniffed. Do they send samples? Do you know when it's coming to the US? Must try. . . must buy!! Les Senteurs do sell samples! 2 British Pounds per sample, up to 6 samples, S&H included. Actually, cheaper than samples at Luckyscent :-)They arrived in about 2 weeks. Biggish samples, about 2ml maybe. I don't know if it is coming to the US. :-( Fingers crossed! This sounds so wonderful!It it so antagonizing to be so overwhelmed by new releases which seems to feel like a daily occurance.I have a weak spot for orientals and this is described so beautifully.Was this scent long lived?Thank you so much for yet another fantastic,lemming inspiring review! Thank you! Again, I have a very strong feeling that you will like this. It is a rich floral oriental with an "oomph" and it lasts a respectable amount of time on my skin. I also think that you might like Mona di Orio Carnation. I would hghly recommend ordering the samples from Les Senteurs. As I said to Judith, the shipping is free and the samples are big enough for several trials. I should be getting some samples soon, the carnation sounds divine. Sounds fantastic. And I love the bottle so much. I only gave it a very quick sniff, but it was indeed a very attractive scent. Lux is excellent too. My wallet is weeping. The bottle is exquisite. Apparently Mona di Orio's bottles are sealed "with a gilded champagne muselet on the handcrafted caps from the champagne House of Jacquesson" and the boxes are "birchwood caskets panelled like the walls of the Dubarry's appartment at Versailles in white and pearl gray." Oh my! Ha, evil fragrance twin checking in. I found all three of the scents a major disappointment, perhaps because I was expecting huge things from a protege of Edmond Roudniska. I would love to hear what R. thinks in more detail too. I tried them before I had read anything about them -- all I knew was from the person who offered them to me: that she had supposedly studied with Roudnitska. That was the primary reason I was interested. However, he also told me he was not at all impressed with any of them. What I love about ER's work is that even the heavier fragrances have a kind of clarity. He was, of course, reacting against the "golden age of perfumery" in a way. The MdOs all strike me as the exact opposite: sort of muddy & heavy handed & overdone. I readily admit that I didn't try them with an open mind. I might have approached them differently if the descriptions had been up on Les Senteurs and I knew what to expect. There is no reason MdO has to make fragrances that show ER's handprint, but the perfumers who have carried on in that tradition are those that tend to interest me most, so it was a disappointment. Meanwhile, yes, Lux was my favorite of the 3, but it is probably the least interesting. Would also agree w/ Victoria that Carnation is probably the best done. You know me well enough to know that Nuit Noire was far & away last on my list! Which is exactly why it appealed to me so much. :-) Still, you are absolutely right, I did not notice much clarity and/or subtlety. I thought that Carnation was the only original composition from the line and quite beautiful. The others were disappointing. I agree with R that it is quite ironic that the perfumer whose teacher was the most trendsetting creator and a true artist simply chose to follow the tradition. I hoped for more. I am going to tackle Carnation next :-) The first sniff was quite promising. A "naturally perfect sense of smell"?? Oh, don't get me started. ;) It begs so many questions, such as "By whose definition? ", and "Can you define 'perfect'? ", and then of course "So what?" Well put! 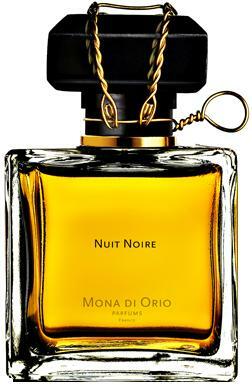 The scents, especially, to me, Nuit Noire, are wonderful, but the website is a little...annoying in some parts. I adore Nuit Noire, too - especially the drydown! oh........last year I was surrounded by Mona di Orio's creations, obsessed I should confess. The earthiness of Amytis, the joyful and pensive come hither of Nuit Noire, the ambiguity of Oiro...And then, one morning, after the shower, they came down from their pedestal. I lamented a lack of ...commitment. They smelled slightly unfinished. I will go back to them, passionately, as ever, but, am I totally wrong in this perception of fragmentary passages?